Any excuse to revisit the 1990s is totally welcome to me, so when I noticed that the Instant Watch feature on Netflix was rife with complete seasons of my former favorite shows from yesteryear on Nickelodeon, I jumped at the opportunity to see them from my now-adult eyes. Considering how much I shake my head at children’s programming of today – having caught an unfortunate snippet of Hannah Montana and that damn Suite Life show – I thought it only fair I take a gander at my own tendencies as a youngster. I seem to recall a lot more creativity and worthwhile storylines back when Nickelodeon’s cartoon lineup was all the rage. To my relief, I’ve not been entirely off-base. 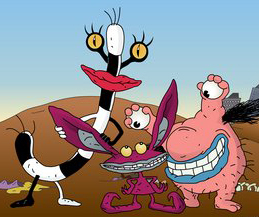 I remembered very quickly that some of my favorite shows in the animation block throughout the decade were the most strange. 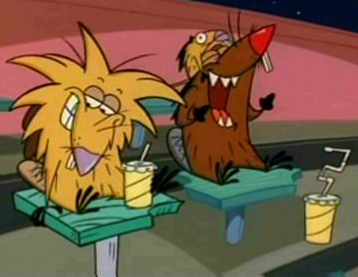 Namely, The Angry Beavers (wow, what an unfortunate name in retrospect) and Aaahh!!! Real Monsters. The former telling the story of two wisecracking beaver brothers forced to live together despite their obvious personality differences, and the latter following the antics of a trio of young monster students learning the ropes of scaring. Seeing it now, with a lot of these shows, I’m noticing there isn’t this inherent need to please an adult audience that you’ll likely find in most animated film efforts, if not on television (for evidence, see anything Pixar has made). But the nice thing about these two series in particular is that there is something beyond the physical humor at face value – some amusing writing and some amazing creativity. Now, beyond my two faves from the nostalgic trip back, some other gems I rewatched were Hey Arnold!, Rugrats, and Rocko’s Modern Life. 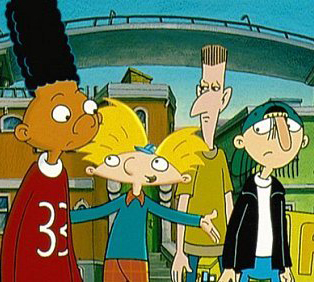 Though my attachment to these wasn’t quite as strong, I found, of the five I reviewed, that Hey Arnold! had the most appeal to a multi-generational audience. And while I remember fondly finding everything Rugrats and Rocko highly amusing as a grade-schooler, the humor doesn’t entirely translate now. Still, it’s tough to put a price on sentimentality. **So what animated fare did you eat up as a child? Does it irreparably harm your memories to rewatch them as an adult? 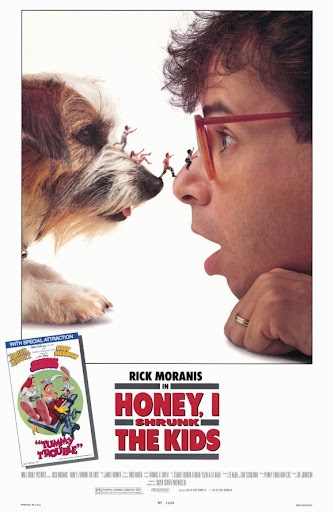 Try to think of a more thrilling unique adventure movie of the late ’80s than Honey, I Shrunk the Kids. What other flick boasted the ability to transport its audience into a microscopic territory where blades of grass were endless water slides, ants were giant pets, and Oreo cookies were 30-feet-tall dessert buffets? Thanks in part to 1980s screen star Rick Moranis (what is it about ’80s actors disappearing the second 1990 hit?) 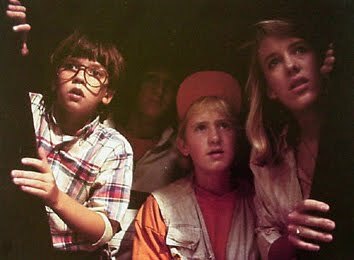 and his endless nerdiness, the movie follows geeky scientist and inventor Wayne Szalinski and his family as his shrink ray inadvertently succeeds (despite his many inventing blunders) in turning his children and the more rough-and-tumble neighbor kids into microscopic flecks. And thanks to the creativity of the writers and the crew, the movie takes to a virtual wonderland in the Szalinski’s own backyard. I mean, what child didn’t want to be shrunk down and wander around on the lawn after this movie came out? The question has to be begged in this situation, what ever happened to those kids? Other than some guest spots on various TV shows, the most famous of the foursome is arguably Jared Rushton (Ron Thompson), who managed roles as Goldie Hawn’s trouble-making stepchild in Overboard and as Tom Hanks’ best buddy in Big. And since none of the parents went on to much following this movie – Rick Moranis already had his Ghostbusters fame and I suppose Kristine Sutherland took the side role of Buffy’s mom on Buffy the Vampire Slayer – it sort of serves as an ’80s snapshot that never really moved from the Szalinski’s uber-dangerous backyard. But lastly, let us not forget the hysterical cartoon short that played before the movie (which to me is an essential offshoot), the Roger Rabbit vehicle “Tummy Trouble,” in which Roger is stuck watching Baby Herman in a series of misfortunes. Perhaps the best part, though, is once the “director” cries cut, and Baby Herman transforms into his actual self – the grisly child actor with the potty-mouthed, cigar-smoking voice of a 60-year-old mobster. Love it. Memorable Moment: The kids are bushed from a long trek across the lawn and take refuge in a discarded Lego (product placement?) for the night. Yet another thing I wanted to somehow try. 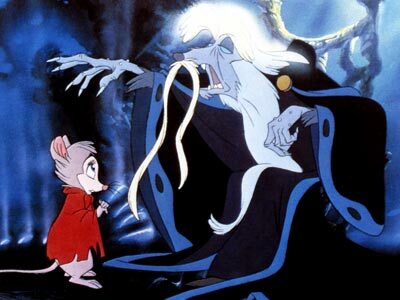 First thing’s first — how many kids grew up with the Don Bluth semi-dark, semi-sweet classic The Secret of NIMH on constant rotation? Assuming not many hands are being raised at this point, let me be the first to tell you that it’s one of the best animated films I’ve ever seen, and it certainly didn’t get its due (perhaps overshadowed by the biggest family movie of all time being released the same year). Thanks to a complex and adult story-line from the novel by Robert C. O’Brien and the family-movie flavor of talking and personified animal, the result is a great mixture. And let’s be honest, we all miss 2D, hand-drawn animation, and this one is a beautiful-looking one to revisit. 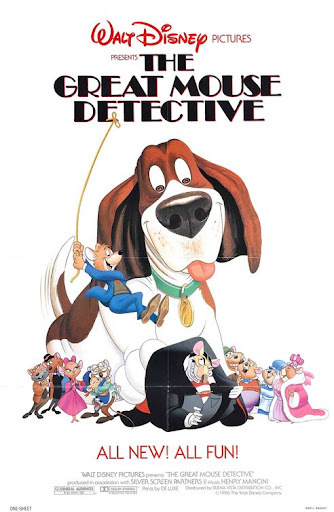 Following the adventures of Mrs. Brisby, the widowed mother field mouse of four, our heroine has little time to find a way to move her ailing, bed-ridden son from the path of the farmer’s plow. 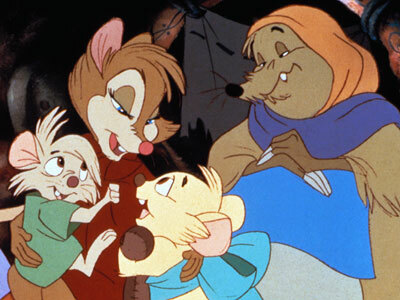 But thanks to her late husband’s mysterious connections with an organization called NIMH, the “assistance” of a bumbling crow named Jeremy (voiced with typical tenacity by Dom DeLuise), the wise old rat Nicodemus, and her own adventurous ways, she goes on a quest to have her tiny house moved from the potential destruction. Just like it sounds, the movie is exciting, endearing, and a rousing ode to the courage of a mother’s heart and the strength she calls on to rescue her loved ones. Now, I am a firm believer in the notion that Don Bluth is responsible for some of the best and most lasting non-Disney animated efforts out there. Dream Works Animation can try to claim that position, but thanks to Secret of NIMH and other efforts (namely, The Land Before Time, the American Tail movies, and Anastasia), Bluth’s got the market cornered on endearing, yet riveting, family adventure films. It’s truly a pity that 2000’s flop Titan A.E. basically ended his career. 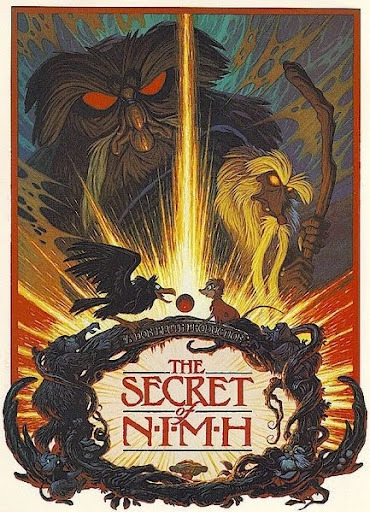 So take this opportunity, whether you are familiar with the film or not, to either experience or revisit The Secret of NIMH. It has all the elements of a great live-action blockbuster in a gorgeous, intelligent, hand-drawn package. 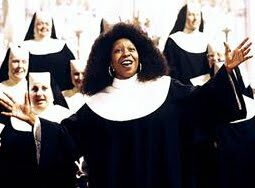 Memorable Moment: Reactions may differ from person to person, but the at-last reveal of Nicodemus is dramatic and effective. (Though, it apparently scared some of my peers as children.) One thing can basically be at a consensus, though: the owl was and is still terrifying every time you watch it. 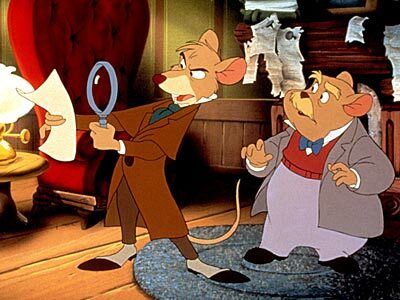 Judging by its relatively quick descent into obscurity after 1986 had lapsed, The Great Mouse Detective is one of those oft-forgotten movies that I just can’t get out of my head. Thanks to repeat viewings growing up (and the magic of home viewing), this one is on regular rotation in my DVD collection. And why shouldn’t it be? It has an exciting and at times surprisingly scary storyline, it features some stellar voice acting (thank you very much, Vincent Price! ), and it includes a score from the great Henry Mancini (not to mention a catchy ditty from Melissa Manchester that – confession – I know all the words to). So, to Ratigan! Though he may be a slimy, contemptible sewer rat (a moniker that my brother and I used to throw around at each other in honor of this very movie), he was a charming adversary to the able, if snooty, hero Basil of Baker Street. 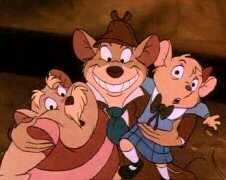 Probably overshadowed by its New York-loving follower, Oliver and Company, The Great Mouse Detective is a surprisingly strong ode to the British way of life. From the big-time importance of Big Ben to the distinguished mouse queen to the traditional Sherlock Holmesian attitude throughout (and is it always raining in London?) it’s a delightful British romp. Memorable Scene: Reminiscent of another childhood mainstay, the board game Mouse Trap, Basil and Dawson manage their way out of Ratigan’s diabolical torture device through sheer cunning. Love it! 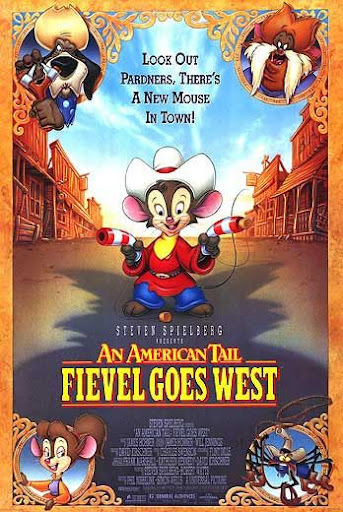 Proof that Disney doesn’t have a monopoly on fun, energetic, musical, nostalgia-worthy pictures, An American Tail: Fievel Goes West is a joyous and oftentimes hilarious ride from the Bronx to Green River, Wyoming. First thing’s first — I haven’t seen the first American Tail movie. I, like everyone else, have of course heard the anthem “Somewhere Out There” countless times, but I’ve never seen the 1986 original. 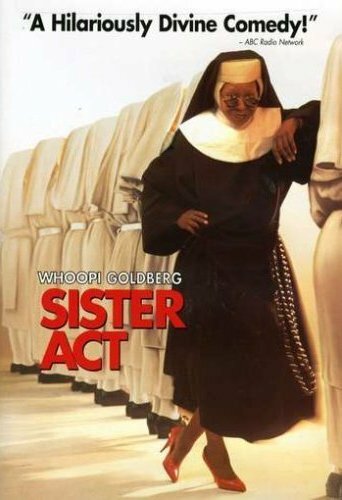 What I do know, though, is that this sequel features a stellar voice cast — Dom DeLuise (hysterical! ), John Cleese (despicable! 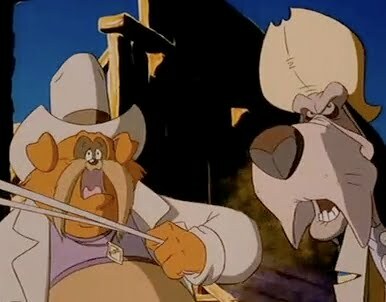 ), and, you heard right, Jimmy Stewart as Sheriff Wylie Burp. 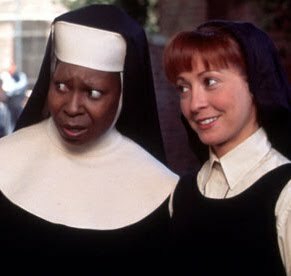 And aside from featuring a few surprisingly great musical numbers (Cathy Cavadini is lovely on the vocals for both “Dreams to Dream” and “The Girl I Left Behind”), this movie is somehow still funny to me as an adult. Chalk it up to my now-ability to appreciate the fact that James Stewart is in this sort of movie (and that it’s his last film performance) and that DeLuise’s character Tiger delivers some pretty gut-busting lines throughout the movie — the “How… do you do?,” the barking lessons, and, of course, the Lazy Eye. And then there’s the strange occurrence of Amy Irving playing the New Yawkese seductress Miss Kitty, while her recent ex-husband Steven Spielberg produces. Gotta love behind-the-scenes awkwardness! So say what you will about most non-Disney animated efforts, but Universal did us a service with this one. It’s a fun and adventurous western tale with a noble and lovable hero, an endearing and sweet-voiced chanteuse, a silly and laugh-peddling feline sidekick, and a distinguished and heartwarming turn from a classic actor who still had it. 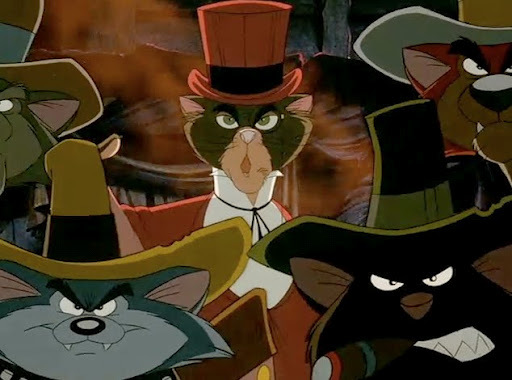 It’s too bad the studio didn’t cash in on potential for more “American tails,” since after this one, it was relegated to the direct-to-video cemetery with fellow excellent non-Disney fare like The Land Before Time. But hopefully we can all remember Fievel fondly as the aspiring cowboy who saved the mice from becoming mouseburgers. Memorable Scene: When Tiger first encounters Chula the spider, his response is pretty entertaining. Thanks again, Dom DeLuise. 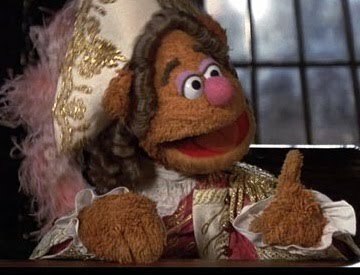 The ’70s had The Muppet Movie, the ’80s had The Muppets Take Manhattan, and the ’90s were thoroughly blessed with the delightfully silly and still genuinely funny Muppet Treasure Island. 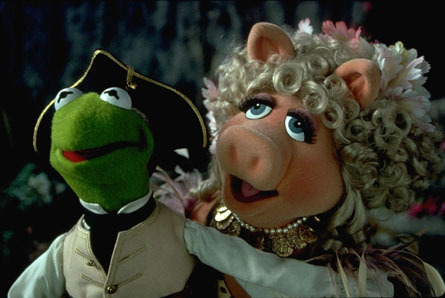 Following Jim Henson‘s famous characters through Robert Louis Stevenson‘s classic, Kermit is Captain Smollett, Miss Piggy is Benjamina Gunn, and Fozzie is Squire Trelawney (and Mr. Bimbo). And they’re joined by famous Brits Jennifer Saunders as hefty innkeeper Mrs. Bluveridge, Billy Connolly as the ill-fated Billy Bones, and Tim Curry as the dastardly ship cook Long John Silver. Not to mention the duo miraculous duo of The Great Gonzo and Rizzo the Rat as, what else, themselves. I seem to recall them fondly in the original 19th Century literary classic. What makes this Muppet outing still enjoyable more than 10 years later (can you believe that?!) isn’t just that I remembered many of the words to “(We’ve Got) Cabin Fever” or that Fozzie the Bear is even more hilarious with a silly wig than without. It’s the fact that watching it makes me wonder why on earth children today aren’t still enjoying a Muppet movie every couple of years. Sure, the last couple weren’t huge box office behemoths, but I find it hard to believe that someone can find more merit in something like a millionth Shrek sequel or a thrown-together Alvin and the Chipmunks bastardized piece of crap. But I digress. The point is that the Muppets were not only fairly wholesome, but (thanks to Statler and Waldorf in particular) they brought an ageless comedy to the table. I mean, any episode of The Muppet Show is still just as funny to me as an adult as it was when I was growing up. 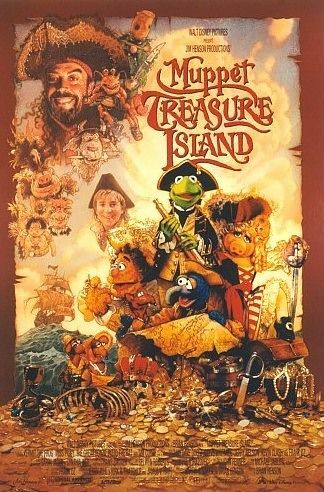 So with their zany antics and liberal plot alterations, what the Muppets did with Treasure Island was one happy trip. They took an otherwise dull string of adaptations of the novel and jazzed it up with a few musical numbers, some colorful puppets with ridiculous voices, and a few pop culture references for the parents. Yo-ho, indeed. Memorable Scene: The boys – Jim Hawkins, Gonzo, and Rizzo – have their first encounter with Trelawney (a.k.a. Fozzie) and Frank Oz’s voice work alone is entertainment enough for an entire movie.